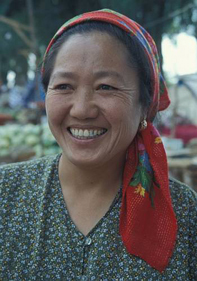 The Kyrgyz Republic is one of the most mountainous countries in the world. 94% of the surface of Kyrgyzstan lies at an elevation exceeding 1 000 m above sea level, 41 % at an elevation exceeding 3 000 m above sea level, and the average elevation is 2 750 m above sea level. The Pamir with its highest peak, Pik Lenina (7 134 m a.s.l. 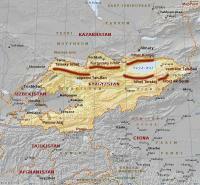 ), straddles the south-eastern border of the country with Tadzhikistan. 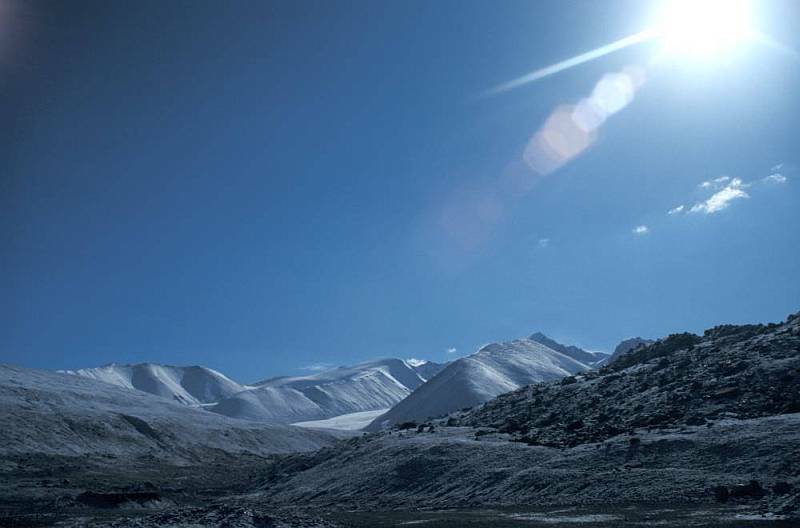 The large Pamir-Alay mountain range runs along the southern and south-western border of the country. It consists of the Alay range to the east and the Turkestani, Zeravshany and Hisar ranges to the west. The ranges reach altitudes of 4 000 – 5 000 m above sea level, the highest peak being Pik Skalistyi (5 621 m a.s.l.). Glaciers are found in all the mountain ranges at elevations around 4 500 m above sea level and higher. The northern and central parts of the country are occupied by the mountain ranges of the Tien Shan. As far as the extent of glaciation is concerned, the most important ranges are the Kyrgyz Ala-Too to the west (Pik Semyonova Tian-Shanskeho 4 855 m a.s.l., south of the capital Bishkek), the Kungey Ala-Too located north of lake Issyk Kul, the Terskey Ala-Too south of the lake (Pik Karakol 5 280 m a.s.l.) and the Kakshal Tau range running along the border with the People’s Republic of China with the Pik Pobeda marking the highest point at 7 439 m above sea level. This is the highest northerly mountain exceeding 7 000 m above seal level world wide. Altogether 8 208 glaciers covering a total area of 8 169.4 km2 are registered in Kyrgyzstan, that is approximately 4.2 % of the total territory of the country. About 40 000 rivers and streams with a total length of 150 00 km are recorded in the territory of Kyrgyzstan. The Naryn (535 km) is the longest river in the country. The second longest river is the Chu that flows through the valley of the same name in the north of the country. The majority of water in Kyrgyzstan drains into the basin of the Aral lake. The rivers Amudarya, Syrdarya, Chu and Talas form the major hydrographic systems. Rivers in the south of the country are part of the Tarim basin, whereas water in the eastern part of Kyrgyzstan is drained by the Karkara river into Lake Balkhash. A large proportion of the water fed from ca 3 500 rivers drains beyond the borders of Kyrgyzstan into Kazakhstan, Uzbekistan, Tadzhikistan and the People’s Republic of China. Lake Issyk-Kul with an area of 6 236 km2 and a maximum depth of 668 m is the largest lake in the country. It is among the deepest lakes worldwide, being fourth in the ranking. 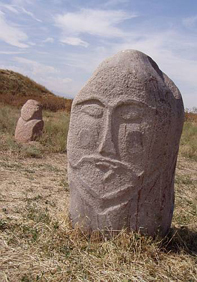 Lake Son-Kul occupies an area of 2 750 km2, and the third largest is Lake Chatyr-Kul covering an area of 1 765 km2. In addition to these lakes, there are another 13 large and numerous small water reservoirs in Kyrgyzstan. Kyrgyzstan lies in a zone of dry continental climate. 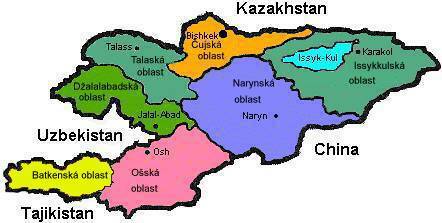 However, a number of regions with their own microclimate occur in Kyrgyzstan. These are governed by altitude and their position relative to the larger climatic zones. 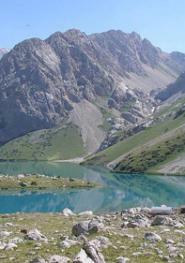 Lake Issyl Kul, which does not freeze, exerts a local influence on the climate of the adjacent regions. The climatic zones change with the altitude. 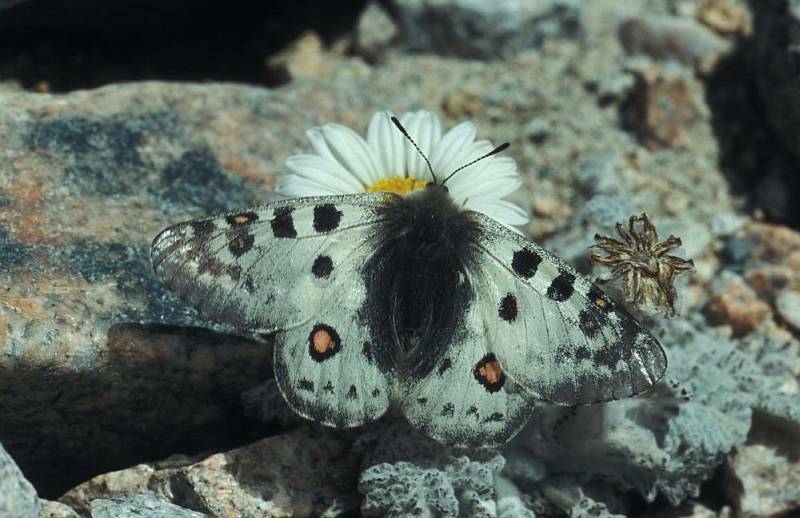 At lower altitudes the microclimate is drier, showing the typical characteristics of continental climate with marked contrasts between the summer and winter seasons. With increasing altitude, the temperatures are lower and humidity increases so that diurnal variations and differences between the summer and winter seasons are less marked. atmospheric precipitation in the northern part of the Chui valley averages around 370 mm a year, whereas in the upper part of the valley precipitation increases to 425 – 500 mm and can exceed 1 000 mm/year on mountain slopes. 2. 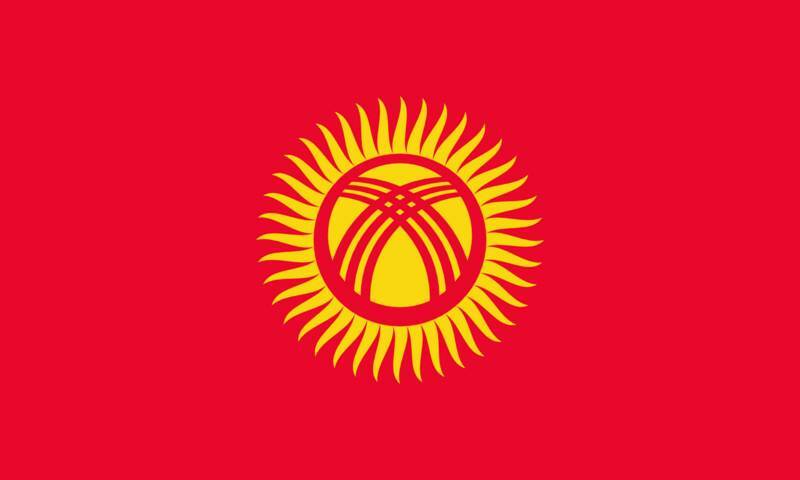 South-western Kyrgyzstan, i.e. margins of the broad Fergana valley, the Chatkal and Alai valleys and the adjacent mountain ranges. relative to other climatic zones, this is the warmest and most humid with maximum rainfall in winter. 3. 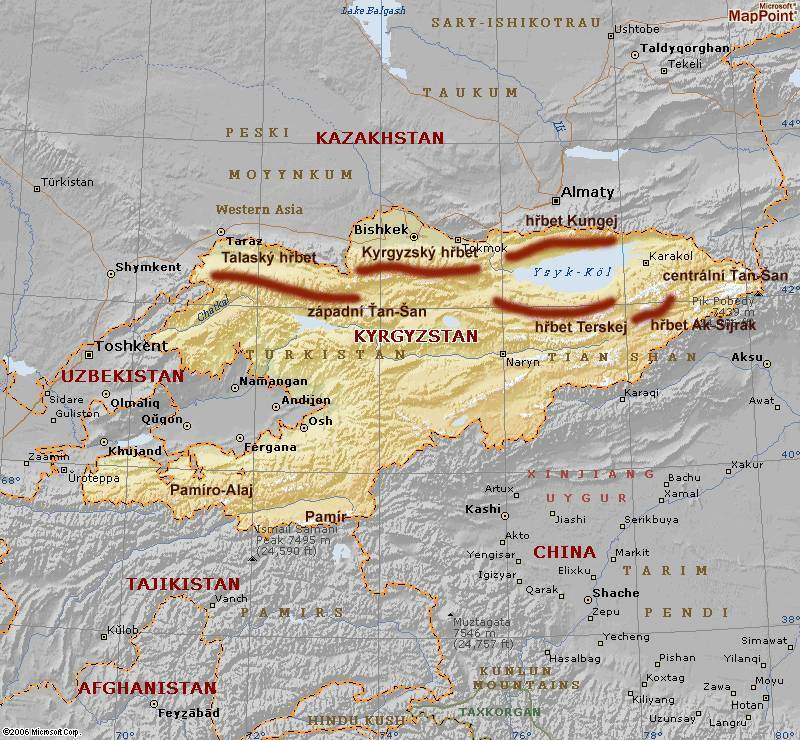 North-eastern Kyrgyzstan with Lake Issyk Kul and the Kungey Ala-Too and Terskey Ala-Too mountain ranges. Precipitation in the central part of the basin ranges from 250 to 300 mm/year, whereas in the eastern part it can be as much as 400 mm a year with up to 800 mm a year falling on the mountain slopes. Annual mean temperature varies from about 9oC at an altitude of 1 000 m above sea level down to – 10oC at altitudes exceeding 4 000 m above sea level with minima reaching – 56oC and maxima at the altitudes mentioned above of 37oC and 22oC. The natural conditions are strictly governed by the character of the local climate, the altitude above sea level and the position with respect to mountain massifs and to Lake Issyl-Kul. A peripheral part of the northern desert eco-system of Central Asia covers the north of Kyrgyzstan, specifically in part of the Chu valley. Here, the deserts pass into semi-desert and arid steppe. In the area of the city of Bishkek and in the central axis of the valley formed by the Chu river, the land is intensely irrigated for the cultivation of corn, sugar cane, water melons and vegetables. At higher altitudes, the Tien-Shan foothills form an arid steppe eco-system. Higher precipitation gives rise to a thick grass cover with shrubs growing in river valleys. This vegetation zone is used as pasture for grazing herds of cattle and horses. Lake Issyk-Kul is a specific region that produces a relatively mild microclimate in its environs. The lake itself is of great economic importance for Kyrgyzstan as a source of fish and also as a recreational area. Kyrgyzstan has a relatively well-established system of protected areas that were designated during the times of the former Soviet Union. Altogether, 93 protected landscape areas are currently registered in the country. These cover more than 4 % of the area of the Republic. 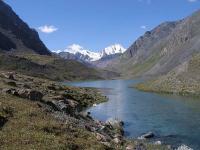 They include two National Parks: Ala-Archa north of the city of Bishkek and Kyrgyz-Ata in the Osh region. Two wildlife sanctuaries were incorporated into the system of biospheric areas within the MAB (Man and Biosphere) program. Lake Issyk-Kul is included in the list of world famous wetlands (Ramsar Convention on Wetlands).